This post is part of a series on improving my card making by studying other designers' cards. You can find more about it here. As you can see, this post differs from my previous posts in this series. I'm not focusing on particular cards by Yana Smakula and Laura Bassen. Rather, I decided to make a card incorporating some of the lessons I'm learning (it's an ongoing process) by studying their cards. 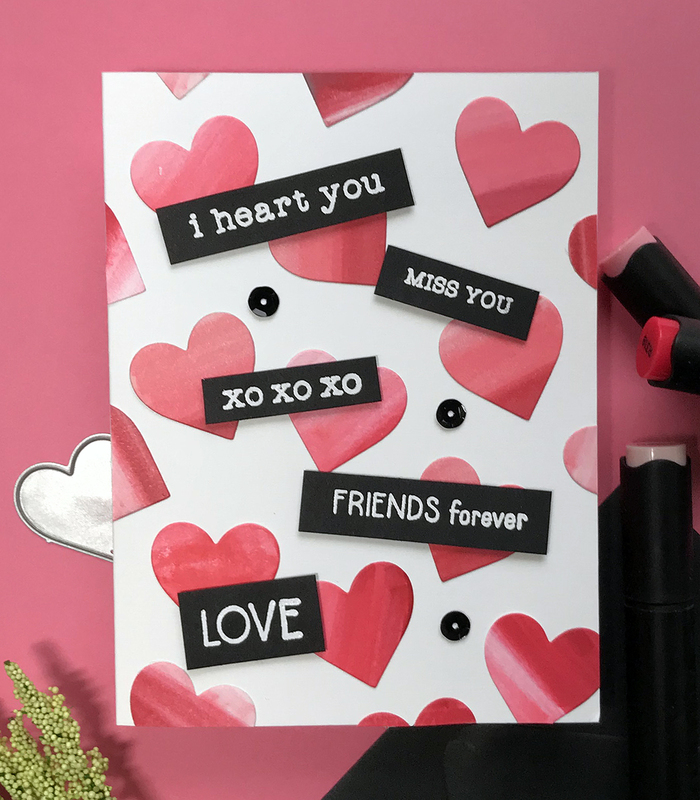 Yana often makes her own backgrounds and pops up a variety of sentiments on one card. Laura blends ink beautifully, often repeats an element for a background, and uses white on black sentiments. So I used those techniques/ideas to make this card. I colored 3 alcohol markers onto white cardstock. I could have blended inks or used watercolors, but I wanted to try the alcohol markers. Unfortunately, my lightest marker ran out of ink and the middle one was on the way to doing so. Therefore, I got more of a striped effect, rather than a blend, but there is no blending police on duty here today so I used the hearts anyway. Not surprisingly, its harder to come up with my own design than to rely on someone else's. Design is a skill. Some have a natural eye; others don't and need to practice (and some of us apparently need to practice for years. HA). Next time I'll lay out all the hearts before I start adhering any of them. I could have spaced them better. I added the sequins after I put together the photo. The card was missing something in the lower right. I felt it needed another sentiment, but I added a few sequins instead. Again, I should have laid out all the hearts and all the sentiments first. Didn't I already learn this lesson 700 cards ago? Whether relying heavily on someone else's design or making my own, stamping is still fun and relaxing. The heart die and the sentiments are from The Stamp Market (sentiment set was a free with purchase and I don't see it on the shop yet. ); Altenew Alcohol Markers (Frosty Pink, Coral Berry, and Ruby Red); Essentials by Ellen white linen cardstock (it's very white and a favorite for card bases); black cardstock; Wow Bright White Superfine Embossing powder; foam tape. MOOD WHEN DONE: Once again I am reminded of how fantastic it is to have a hobby I love. You've picked two star designers for inspiration and it's fun seeing where it takes you! The card rocks and certainly reflects some of their design sense but even more, your personality! I love the stripey hearts - happy accident. And 5 is an odd number, so having 5 sentiments on your card strikes the perfect balance. I really like this card! This worked out really well! I like the stripey hearts too — they have a sort of marbleized look, and the colors bring to mind candy and ombre icing, increasing the 'sweet' factor subconsciously, besides adding great visual interest. Honestly, the stripeyness is probably my favorite element of the card. I especially love the heart in the lower right, so I'm glad you added sequins instead of another sentiment, which might have covered it up. The odd number of sentiments works well, also, and the contrast between the black-and-white sentiments and the reddish hearts is fantastic. I think the hearts are great looking, didn't notice a stripe, thought it was that you used dp! I never layout a card and seldom even think about what I'm going to use for the elements...usually they work out for my style and that's what I'm going for when I'm finished! Super cute card. I can't imagine the hearts without the stripes. Now if I could replicate those cool stripes. Invaluable lessons and observations Joan. Yay! Keep it up. Thank you for sharing your cards and lessons. I try to plan my card, but whimsey seems to take over. I always enjoy your cards and commentary. I concur with all the Yes! votes for the striped hearts....much more visual interest, made the card! Turned out GREAT!!! P.S. I'm still practicing, 25+ years later... LOL! Backgrounds are hardest for me. I thought the stripes were part of the plan. They look great! In fact, your whole card looks great to me because I don't see the picture in your head. I'm still learning and being ultra-critical of myself, but I have to agree that stamping is still fun and relaxing (usually). I love that my comment always seems to come after Leslie Miller's (a designer that I've loved, learned from, and followed for a very long, long time). Joan, your idea to do this series is an idea that's time had come - seriously! I'm so glad you did it. I've seen so many card crafters weigh in on the difference between copying and CASEing someone card. You've shown us how to learn from others in a way that makes perfect sense, and still feel good about sharing what we've learned. Your card is fabulous, and like Leslie, I didn't pick up on any discrepancies until I read your post (I look first). And even then I don't think it matters. The wonderful thing about paper-crafting is there's always a next time (she smiles). I think your card looks wonderful. I like the way the colors look on the hearts; I think the placement of the hearts on the paper is fine. Thank you for sharing this.